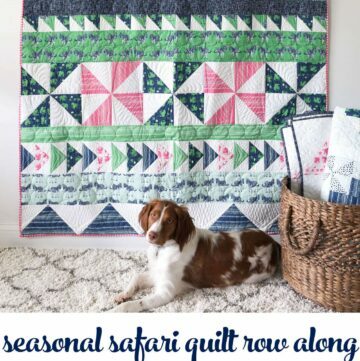 Today we are moving on to row 1 in our Seasonal Safari Quilt Row Along. If you are joining us now, welcome! This is the 5th row in the series. 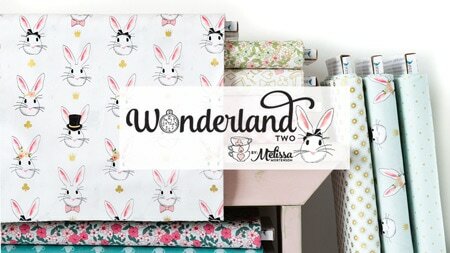 To see all of the rows posted thus far you can CLICK HERE. If there is a row that you don’t see, that means that it has not been shared yet! Before we start into today’s tutorial I wanted to let you guys know about something fun that happened this week. 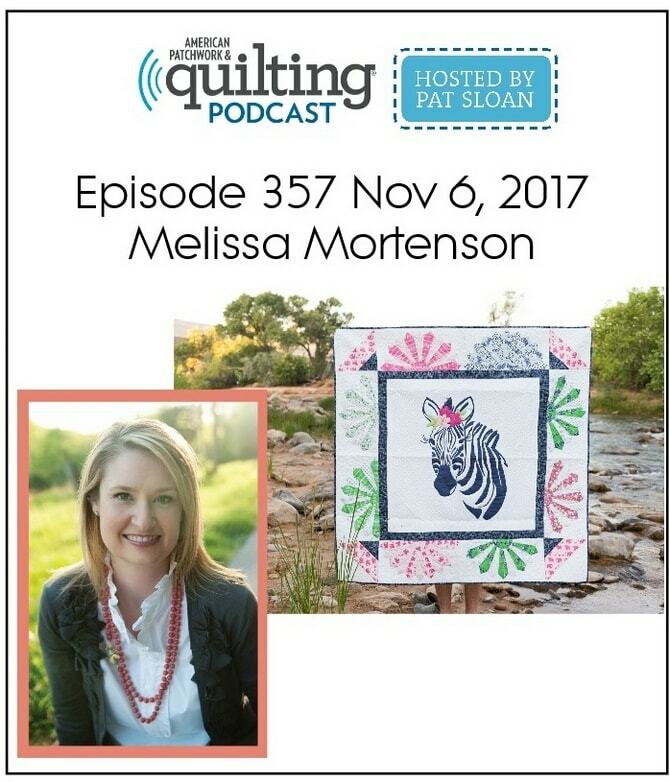 I was able to be a guest on Pat Sloan’s radio show! It was such an honor for me since I’ve been a big admirer of her for a while now. 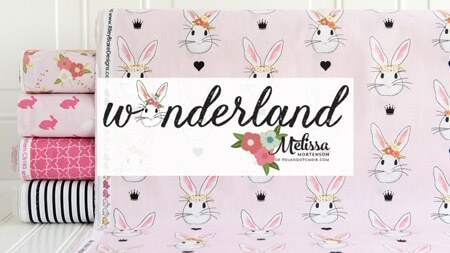 We were able to chat a bit about the inspiration for my Safari Party fabric line and some of the things I have planned for the near future. 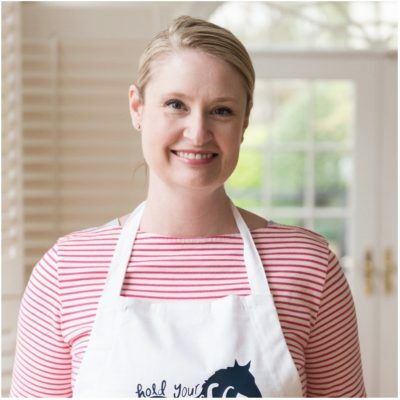 We also chatted a bit about the Holidays and I shared a few of my favorite Holiday decorating tips! Okay! Now onto this weeks Row! As a reminder, we are not doing in order by row on the quilt, but rather by difficulty. Starting with the simple blocks them moving on from there. 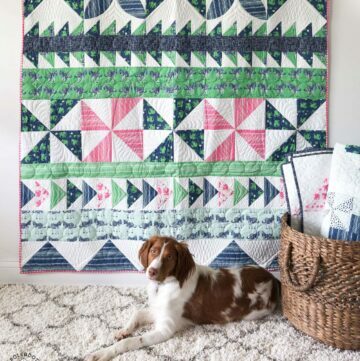 That way the quilt becomes a skill builder quilt for you. 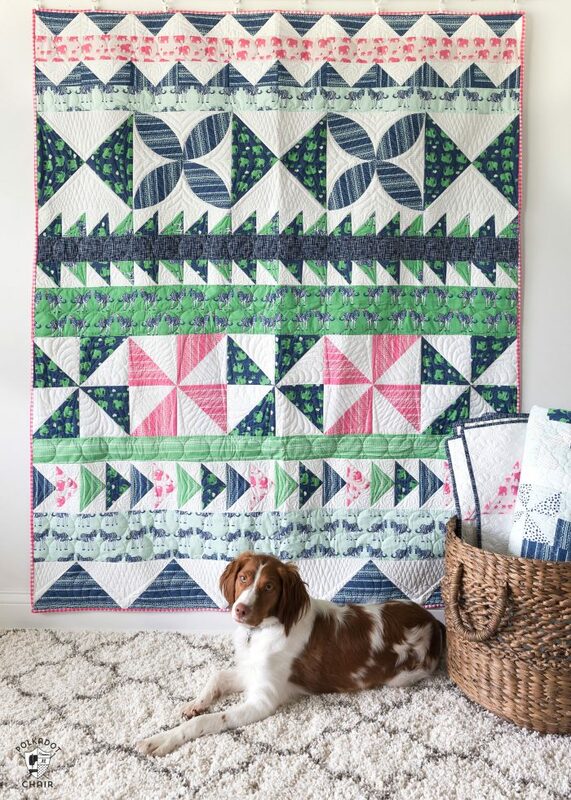 If you’d prefer, we now have a PDF that you can purchase of the entire quilt pattern. It includes all of the rows in one document, so there’s no need to go back and forth between blog posts. 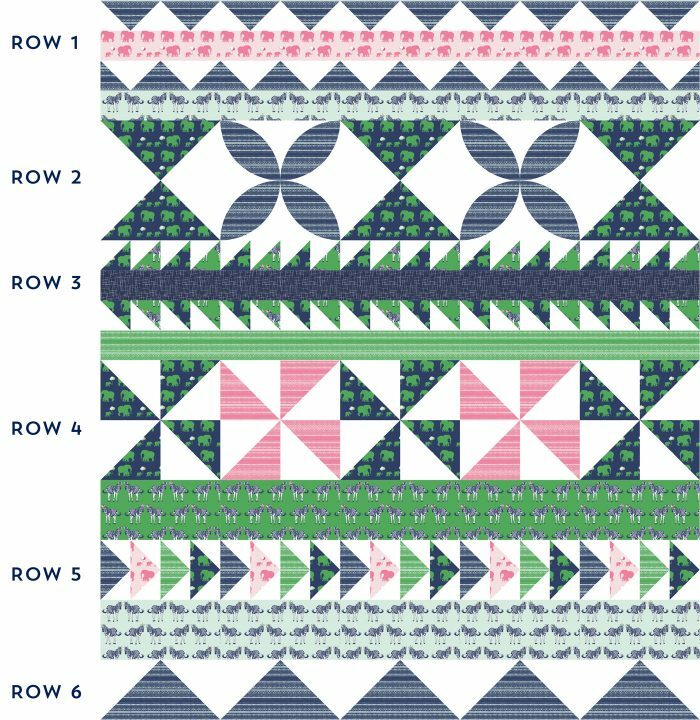 This week we are working on Row 1, which is made up of a stripe and two rows of flying geese. This row is a bit of an “optical illusion”. It is actually a row of navy flying geese on top of a row of white flying geese, with a border between them. When stitched together the blocks look like giant zig zags. For row 6 we made flying geese. This is the same technique but of a different size. Let’s start with the navy geometric flying geese. 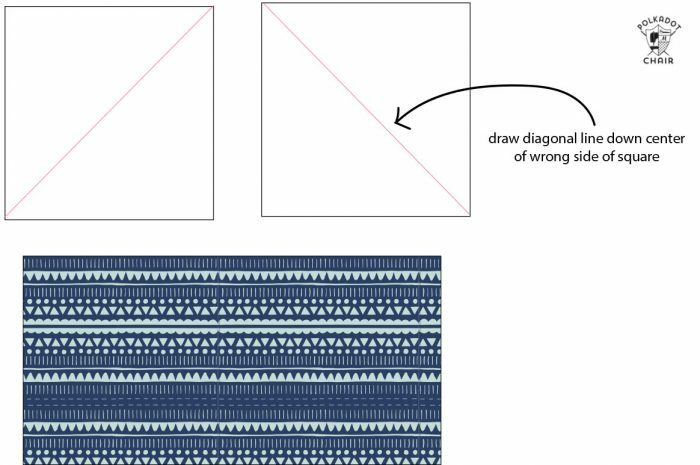 On the wrong side of two of the 3 1/2″ x 3 1/2″ white squares draw a diagonal line. 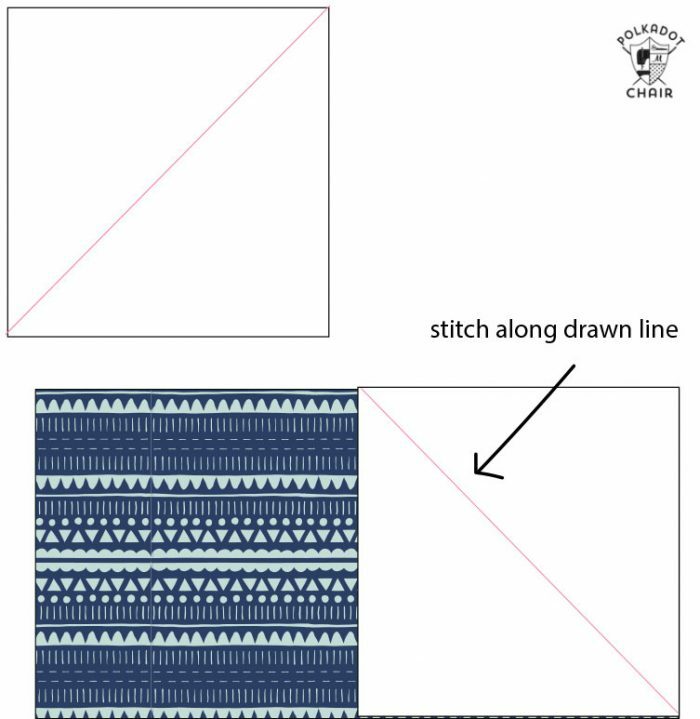 Layer one of the pieces on top of the navy 3 1/2″ x 6 1/2″ piece, right sides facing and stitch down the line you just drew. Next cut 1/4″ on the OUTSIDE of that line. Flip the white piece up and press. Then just repeat it for the other side. 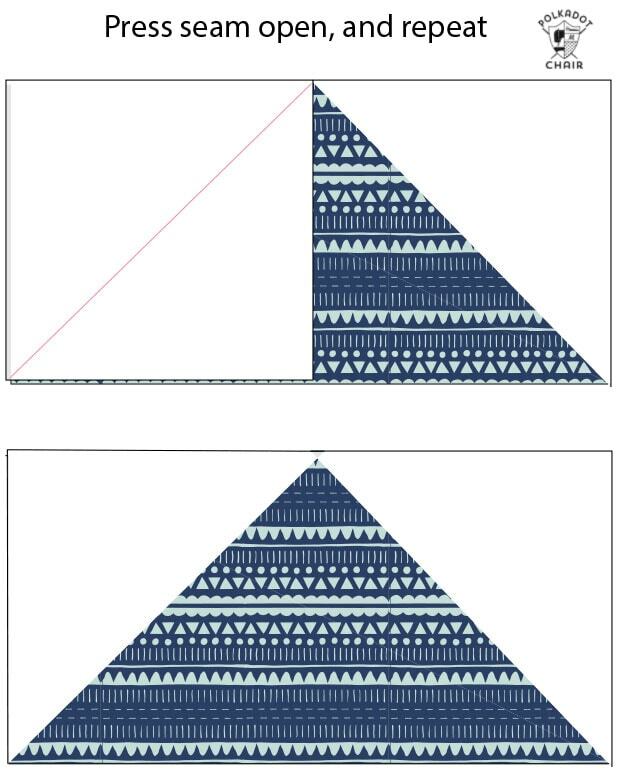 You need to do this with the navy geometric 3 1/2″ x 6 1/2″ pieces until you have 10 sewn flying geese blocks. 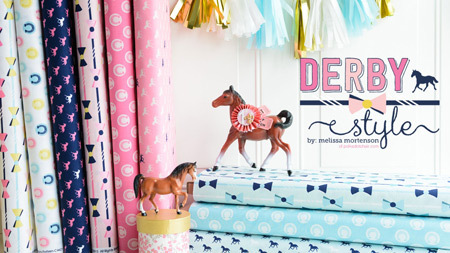 Now just repeat the same thing with the white 3 1/2″ x 6 1/2″ pieces and the navy 3 1/2″ x 3 1/2″ pieces. 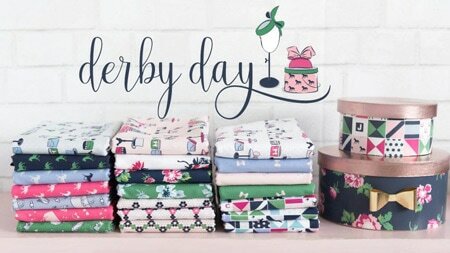 You should now have 20 sewn flying geese blocks. Stitch 2 of the Navy flying geese together along the short sides and press seam to one side. Stitch 2 of the White flying geese together along the short sides and press seam to one side. 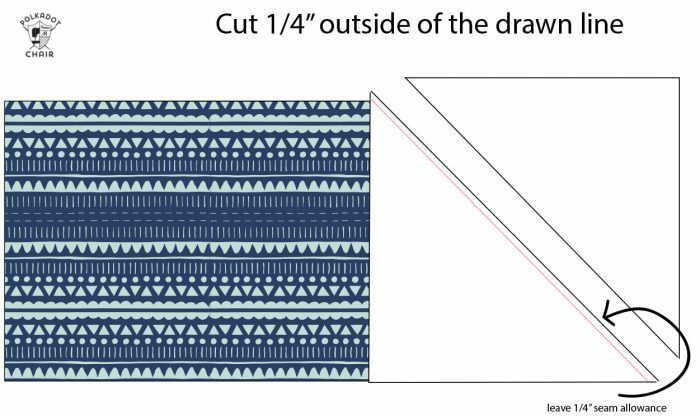 Stitch the row of navy flying geese to the 3 1/2″ x 12 1/2″ pink piece of fabric as shown in the diagram above. 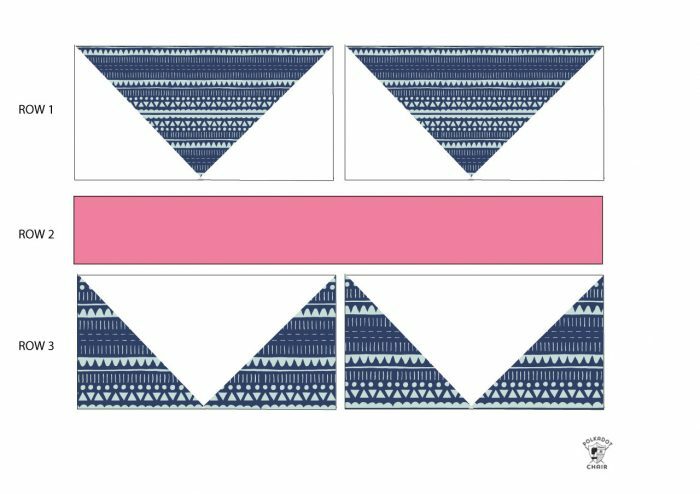 Stitch the row of white flying geese to the pink fabric as shown in the diagram. Repeat until you have 5 blocks. 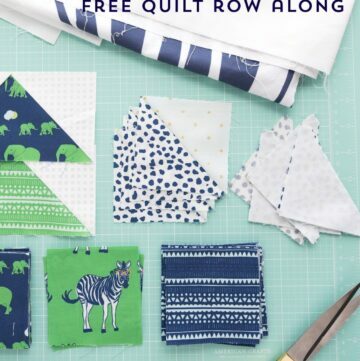 Stitch all of the blocks together into one long row. That’s it!! We are in the home stretch, only one more row to go! See you next week!